- For covering wood boats with fiberglass cloth. 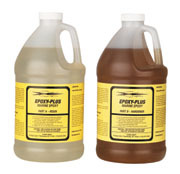 Epoxy-Plus is a premium grade marine epoxy. Easy to use with a 1 to 1 mix ratio, no amine blush, no sanding between coats, low viscosity for easy fiberglass wet-out, longer working time for the amateur builder. A proven product for over 35 years. It cures to a flexible, resilient surface, able to withstand flexing and impacts better than harder, more brittle epoxies. Cures ultra clear, ideal for clear finishes such as cedar strip boatbuilding. Use for stitch & glue, add wood flour for structural fillets. More Information on How To Use Epoxy-Plus. Note - units priced below include resin and hardener. e.g. a 1 gal. unit contains 1/2 gal. of resin and 1/2 gal of hardener.